I couldn't get enough credits to get the Iowa yet but it should have similar playstyle so there's no rush. Shoot. That's what I should have done last weekend... converting the XP for the Nelson (not as interested in/can't be arsed to save up 900k for the Mighty Mo). In my defense, new puppy. Congratulations on USS My Wife Has No Complaints, Trust Me. Benson is such a fantastic ship. Mahan isn't a bad boat, but I found the huge spotting distance tough to deal with. The Benson is much easier to play with at short range, and the torpedoes are easier to alpha with and offload quickly of course. Dude, only 2 citadels out of 402 gun hits? I don't often play CV, but when I do I like to win 44:12 against a fighter Midway....and an OMNI div on stream. So I decided to switch clans from AAO to ALN. What prompted that? I have zero involvement on WG forums or any info source outside of here and YouTube. In "hell froze over" news, the effectively rebooted World of Warplanes is... actually really good. I haven't touched WoWS since I downloaded it yesterday. There's a lot of AI players since server pop is still low, but enough real opponents (and, also, mechanics of AI fighters playing air defense for cap points) that it feels like a credible PvP effort. IMPORTANT: You have until the next patch hits (tomorrow or today) to buy Belfast, Kutu and Perth. After that time they will be gone forever from sales. So... how bad will the Britisch cruiser line be nerfed after the smoke changes? Unlesss you manage to nail them with torps BBs jusst have to cross into 7-6km range to spot you. And there is no way you are DPS'ing down an angled 8-10 BB in the time it takes him to sail from 12 to 7 km. Even funnier is that DDs can outspot you even when in your own smoke. They can even just pop their own smoke and kill you with guns with you not being able to do much except charging at them - and that is an open invite for any ship to crit you. I just hate these changes. They heavily punish teamplay (like when you smoke up an ally in a DD), punish players that push for objectives. Ofc it is a huge buff to things that dont need any buffs like BBs and the Khaba. Also it is not like tools to get rid of smoke don't exist. Hitting things in smoke is relaively easy. And then you got planes, hydro, radar that lasts for a minute and can reach 10 km....and still potatoes cry about smoke. Yeah... I never felt that smoke needed balancing. Enough countermeasures for it as it is. It is just part of Wargaming's strategy to turn it into an esports by making the games go quicker = more watcheable. Right now comp is smoke blobs staring at each other. WHich is really thrilling for the player - especially when torpss are incoming on you - but lesss good for viewer numbers. Also smoke firing is one of the main whines people complain about when uninstalling. 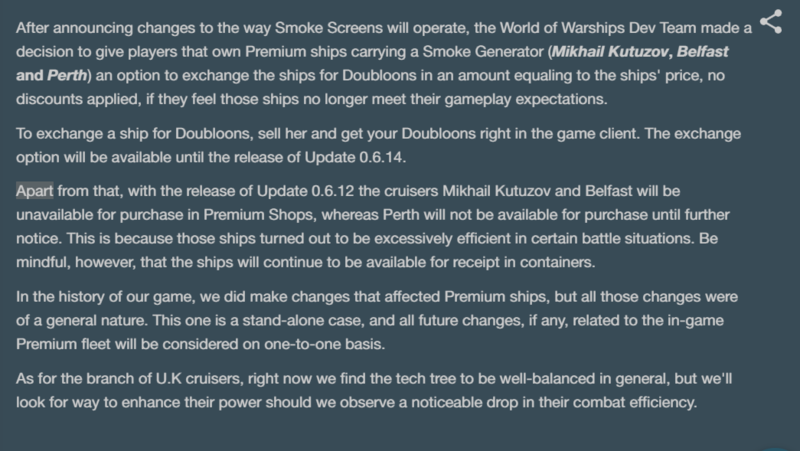 So instead of making a tutorial WG tries to massively nerf it. Because keeping mentally track of 100+ stealth ranges of smoke shooting is apparently less hard to figure out. Oh and they wanted to nerf it due to Belfast and Kutu being op...and because they can''t nerf premiums they have to do it as a global change...and they still have to offer refunds. 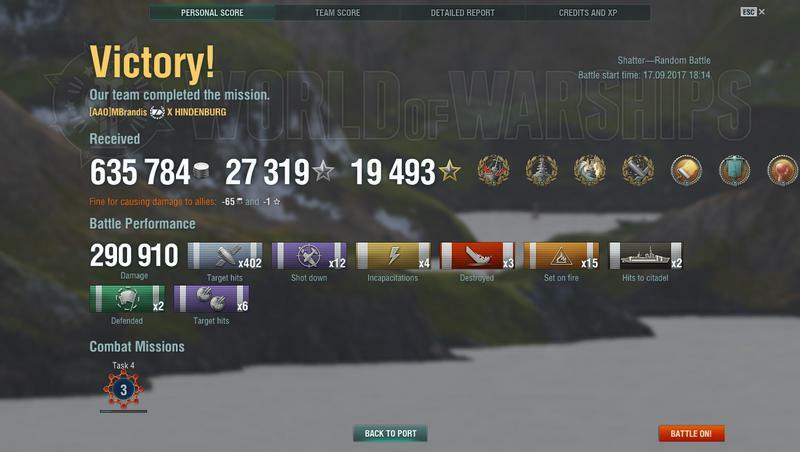 GG WG. I'm thinking of selling my Belfast. Anyone been playing the new Halloween event? It's batshit on a sandwich hard compared to the first one, albeit still doable, especially if your BBs and CV have some clue what they're doing. I got 4 stars pretty quickly but haven't had the time to go back and grind for that 5th. Got something like 15,000 free XP and some gold out of it, which is nice. After playing 8 Kutuzov games over the past week I can only caution people against selling their Kutuzov and/or Belfast. The smoke nerf is a nerf, yes. But if you play a bit more cautiously you will probably get the same results as before. I averaged a 100k on Kutu, which was well in line with the goal I had set for myself. I've only played a handful of games since the changes but my impressions have been mostly that smoke now helps you play aggressive safely or makes defensive play a lot more survivable... before, a lot of people used like a magic win-button to make sucidal plays work, or at least assumed that was how it worked and wasted their ships in the first 3 minutes. Go help save the texas pls. The USS Texas package is on EU as well. I just spent 35 EUR to help save the Texas.